On the day of Pentecost, the disciples were all filled with the Holy Spirit and spoke with other tongues. The other tongues were Spirit utterances, from the Greek word apophtheggomai. Many have understood this to mean that God only enabled them to speak in the known languages of the people who were there that day, but it was more than that. The words the disciples spoke carried the anointing of the Holy Spirit they had received! 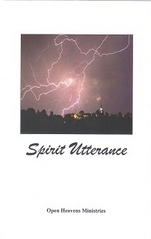 This book will help give a greater understanding of Spirit utterance.